I think I can officially say spring has finally come here in the northeast and I’m so excited that we’ve been able to spend plenty of time outside. Just last week, I bought some new sand for Rosebud and refilled the sand box. I threw in some buckets, shovels and molds. It keeps her busy for a while. When I was a kid, I spent hours in the sand box so it’s no surprise that she likes it as well. There are so many reasons to encourage kids to play with sand. Here are five of them. 1. It helps with fine motor skills. Scooping, pouring, sifting and sculpting the sand helps build strength and is practice for skills they will need later. Not to mention scooping, pouring and measuring can be connected with math concepts. 2. They can be creative. Sand can go with almost any theme. You can use it for a beach theme with shells, toy fish and rocks. You can use it for an animal theme with logs, toy animals and other natural items. Sand goes with cars and trucks, in an outside kitchen and even in art. Yesterday, Rosebud was pretending to serve ice cream one minute, building a sand castle the next and then decided to look for rocks and other treasures. 3. It’s a sensory experience. One of the things I hear a lot when people talk about going to the beach is their feet on the sand. It’s part of being connected with nature. I think that urge for kids is even stronger. I work with a lot of kids with special needs. I’m not a big fan of that term, but I’ll use it here to keep things simple. Many of these children find playing in the sand calming. 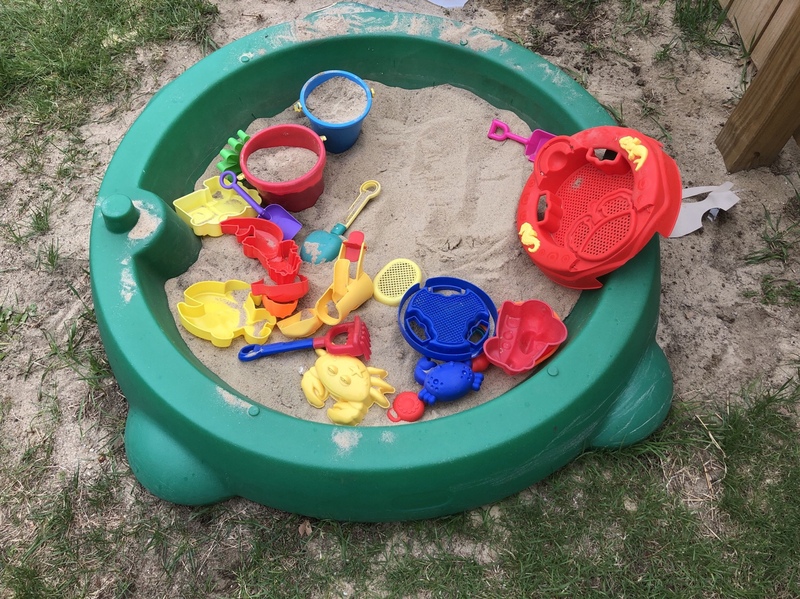 Some children that cannot stay put for even two minutes will stay at the sand tray or sit in the sand box for 20 minutes plus. They are able to immerse themselves into the activity because it is open ended. There are no expectations for what is right or wrong. They can experiment as they wish. 4. It’s scientific. Sand can be experimented with. It doesn’t always remain in the same state. Rosebud discovered that her sand in the sand box is dry because we keep it covered at night. The sand is fine. It slips through your hands and you can’t sculpt with it. However, we also have this wagon that is full of last years sand that was very wet. It has dried out quite a bit, but it is still wet enough to sculpt with. Rosebud and I were having fun seeing what we could make. We filled buckets and discovered that the sand could be dumped out and keep it’s shape. We could build sand castles that would stay together. We didn’t need a mold. This sand was heavier and stickier. Experimenting and investigating the results is what our little scientists do every day. 5. It’s fun. Playing in the dirt is fun. Being in nature is fun. Making a huge mess is fun and the best part is most of it stays outside so I don’t have to clean it up. Watching Rosebud enjoy herself was the most fun for me. I think making a mess and seeing what she can do with the sand is the most fun for her. Why not see what happens when we fling sand outside of the sand box? Why not fill the wheelbarrow and dump it in other parts of the yard? Never mind that I just refilled it. Why not try dumping the water bottle in the sand box and see what happens? I drew the line at flinging the sand and dumping the water, but the important thing is spending quality time together. That’s the best thing about our outside time. We are not distracted by the normal things that distract us inside.